In Special Reports this week’s files cover: Ukraine’s First Astronaut Claims UFOs Are Real, Face On Mars, Base on our Moon marked with M and Y, UFO Maps of Sightings, and Infrared Cameras. Unidentified Aerial Phenomena were spotted over: Arizona, California, Florida, Illinois, Missouri, New Jersey, North Dakota, Ohio, Oregon, Pennsylvania, Tennessee, Texas, and Washington DC. UFOs were also seen in Canada, Cyprus, Germany, Philippines, Russia, Spain, Ukraine, and the UK/England and Scotland. The purpose of these files is to report weekly the UFO eyewitness and photo/video evidence that occurs on a daily basis around the world and in space. These Files assume that extraterrestrial intelligent life not only exists, but my hypothesis is that the over a thousand UFOs reported each month represent technologically advanced spacecraft conducting surveillance of Earth. I personally became interested in UFOs when I chased one over England when flying for the US Air Force. The US Air Force under Project Blue Book investigated UFOs for more than twenty years, we continue this research. I believe the God of the universe has spread life throughout the cosmos and UFO’s are visiting us in ever increasing numbers. He has studied the topic and has come to the conclusion that UFOs use electro-magnetic and gravitational forces to fly. He argues that the current human method of travelling into space has run its course and it is time we too attempt to develop methods using these forces for space travel. He believes in this manner we will conquer space’s mind-boggling distances. Thanks to Michael Cohen m.cohen@allnewsweb.com To read the full interview click here. 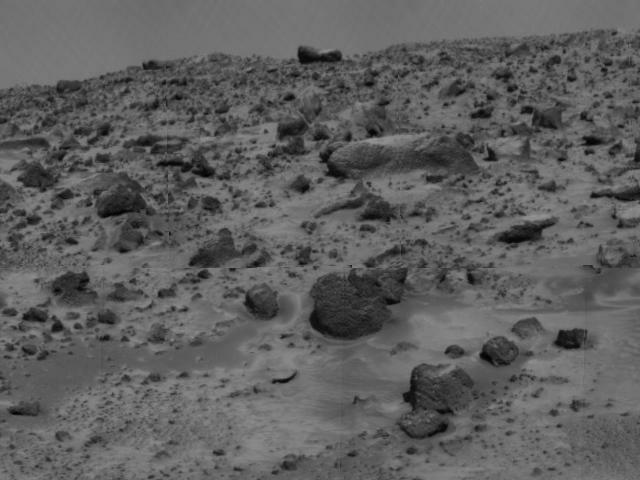 Elizabeth Fuller writes, “I wanted to bring to your attention an item of interest I found on the Mars Pathfinder website that caught my eye due to the unnatural looking, broken stones throughout the landscape. Just a little below and to the left of center, take a look at what looks distinctly like a carved human head - a man with hair, eyes, ear, and what looks like a beard. No matter what angle I view this from; I see a human head severed at the neck. Mike writes, “The Sacred Site shown on Google Mars is a blacked out square, its location is important since the Sacred Site there is like those at Stonehenge and Avebury here. This Sacred Site sets it apart; it’s where forces from the planets core rise to ground levels and is similar to here in England and in Europe. Cathedrals and many Churches now stand on these positions. Both Venus and now Mars have just one place on the planet, where this influence remains from ancient times, but in the Mars case the area is blacked out?? This HAS to mean something marks that area, dowsing can see through the blacked out portion, and the special energy is right at that precise position...Can you see what this means, either the people of Mars or some passing alien visited this place in the past, I dowsed the site to 6 billion years old, with the planet to 11 billion years old. On Mars this important area is blacked out, WHY? Thanks to Mike N.
Rumors persist of alien bases on the Moon and Mars that Disclosure Project witnesses saw while working for NASA. This possible Moon base has a letter similar to our ‘M’ in the upper center and a ‘V’ at the bottom center. I’ll admit it is hard to see the base, but the letters are pretty clear. Many believe there is an Alien Base on the moon where they mine key minerals. Intelligent extraterrestrial beings apparently travel to various places in our Solar System. The large distance between solar systems necessitates a stopping-off place, an oasis, a refuge base, and refueling points. Our Earth provides an opportune place for maintenance, refueling, research, and rest for the beings on a long journey. Evidence indicates the UFOs entering our atmosphere use a great deal of electrical energy and measurements of their propulsion systems generate power equivalent to power plants on Earth. Reports from South New Jersey, Toronto, and other places suggest the craft are taking on electrical energy when hovering over power lines or power plants. Fisherman report the craft hovering over large bodies of water apparently taking on both water and fish. Hunters report wild animals and domestic animals being taken. Craft are often seen entering and leaving bodies of water or mountainous areas where rest and maintenance can take place. Water contains both oxygen and hydrogen that may be used as a source of propulsion. Remote viewers have found bases on Earth where they observed a maintenance staff, living quarters, and research laboratories. Astronauts in private suggest the aliens have a moon base called Luna shown above that mines a dark colored mineral. SEDONA -- The photo was taken May 1, 2009, from the King's Ransom Hotel at 9:11 AM with an iPhone. It was taken through a window that had dark spots from dirt but the light spots represent some type of orbs. There were no lights on inside the room to cause a reflection that result in the bright "objects" seen in the sky area of the photo. There was a slight cloud cover. PHOENIX -- At around 9 PM, on May 9, 2009, I went onto my back patio and saw a saucer shaped object similar to the one I saw the previous night. It was hovering and pulsing vibrantly on the horizon for about an hour or two on May 8th, with about twenty planes, mostly non commercial or helicopters fly past it. I watched it get progressively dimmer as if it was flying away slowly and eventually disappeared. When I tried to take a picture of it, I saw a ball of light pulsing green, blue, and red appear in my viewfinder as a string of 5-6 separate lights that would **** on and off at undetermined intervals. MANHATTAN BEACH -- I was driving east on Gates Road in Redondo Beach on May 5, 2009, when I spotted a large horizontal vapor trail that didn't vaporize. It was moving south with a short vapor trail, stopped, and flew north. A second object, an orange fire ball was spotted in northwest sky - that looked like the sun was reflecting off of a much bigger object, as if I was just seeing a small corner of a stealth hidden plane. I called my brother, who lives a little further south and he confirmed that he too saw something strange. TAMPA -- Two friends and I were standing in a parking lot talking at 9:30 PM, when a bright green sphere about the size of the moon shot across the sky. One of my friends, whose shoulders were almost parallel to the object’s path, got a really puzzled look on his face and pointed toward the sky. I turned to see a very bright, light green object about the size of the moon traveling from south to north. My second friend turned around and saw the bright light travelling quickly behind the clouds. The object was definitely circular and had a tail about twice the length of the object that gradually came to a point. It was only visible for a second or two due to clouds and trees, but I was able to see it cover about 40 to 50 degrees of sky. It looked very much like the green ball a Roman candle shoots out, but without any smoke. There is no likelihood it was fireworks due to the lack of noise. PENSACOLA – On April 22, 2009, I was traveling toward Highway 98 on Blue Angel Highway and saw something that looked like it was going to collide with a plane. I became very anxious at this sight and tried to figure out what it was. One object was too small to be a plane but it was not shaped like any bird or move like one. As I drove closer I saw it was round and maneuvering around the plane. My five year old commented that it looked like someone kicked a ball up there and it couldn't come down. I thought maybe it was a shiny Mylar balloon. Ferguson's Airport is further down 98 and the plane turned and took off in that direction. CAHOKIA MOUND STATE PARK – On April 25, 2009, the photo was sent via file forms on our website. Little is known about the object in the photo. It is likely that object was not seen and was later discovered in the photo. The sharpness (clarity) of the object is marginal. FLORISSANT -- I witnessed a group of bright pin point lights at 7,000 to 10,000 feet altitude moving south on May 9, 2009. They appeared to be disk in shape and moved in an unorganized formation. I photographed the objects on my rear apartment balcony as they passed. I then ran through my apartment and continued to photograph from my front balcony. The objects stopped suddenly and floated in the sky. Then they went separately in various directions. One or two went straight up till out of sight. I called a friend who also saw two lights in the sky. where are the videos/pics to these? PADERBORN – Michael Cohen writes, “This video that can be seen on Youtube shows a series of a dozen blinking lights caught close up and moving off into the distance on April 22, 2009.” The sighting occurred at dawn. It sure seems an odd time of day for anything other than a UFO to be buzzing the town centre. CLARK AFB -- Senior Master Sergeant Allen took this picture of a winged craft over the nuclear weapons storage area at Clark Air Force Base in the Philippines in 1972, during the Vietnam War. Clark Air Force Base was part of the Strategic Air Command and played a large part supporting operations for the Vietnam War. The picture was taken with a Nikon F-2 camera. This picture was found , stashed away, in an unmarked box by the son of Sergeant Allen. Thanks to UFODC.COM and Ken Pfeifer Mufon N.J. Allegedly the filming took place on May 3, 2009. This rather remarkable UFO was filmed by a farmer working in his fields in Russia. Not much is known about the video such as the exact location or the individual that filmed it. It is receiving a fair bit of coverage on Russian UFO and paranormal forums and many UFO experts seem rather impressed with it. One UFO researcher, Mr. Avi Moas of Las Vegas, Nevada, referred to the craft as a 'Mothership'. SENELNIKOVO - The residents of the Ukrainian town in the Dnepropetrovsk region have been seeing strange objects in the sky for weeks and UFOs controlled by aliens were suspected. The talk of a UFO landing base near the Black Sea has been going on for decades. An enormous luminous pink sphere was seen slowly descending to the earth and given the nickname 'Lamp'. It did not land, but moved along a trajectory that seemed to follow the power lines. A town resident called on a team of Ufologists headed by Mr. Vladislav Kanuka, a veteran Ufologist with decades of experience, for help. GLASGOW -- I try to spend a few hours at night with my telescope and binoculars and have seen many UFOs, but they're always so fleeting? But on Monday morning, I saw a perfect cube appear right before my eyes! I was looking at Zubeneschamali, which is the beta star in Libra, when the cube just came out of nowhere! I saw a brilliant perfect cube with an illuminated border that was moving quickly. It changed color from blue to aqua-green and stopped cold. I grabbed my digital camera and managed to take one picture as it moved away backwards to the point it appeared and it was gone.